The Rolls-Royce VISION NEXT 100, codenamed 103EX, today made its North American debut at the historic Barker Hangar in Santa Monica, California. 103EX is the marque’s first ever pure ‘Vision Vehicle’ and defines the future of luxury mobility. It presents an intriguing and aesthetically dynamic vision of the future of luxury mobility – a completely personal, effortless and autonomous Rolls-Royce experience, wrapped in a design that ensures a ‘Grand Sanctuary’ for its occupants and a ‘Grand Arrival’. 03EX is one of four visionary creations announced by the BMW Group in Munich on 7 March 2016, as it launched its centenary celebrations. In addition to being the centenary of the BMW Group, 2016 also represents a seminal moment in the history of Rolls-Royce Motor Cars. For Rolls-Royce, the end of production of the seventh generation Phantom – considered by aficionados to be “the best car in the world” – represents the completion of the first phase of the Rolls-Royce brand’s renaissance under BMW Group custodianship. The success of Phantom, Ghost, Wraith and now Dawn serves as the foundation for a bold new chapter. 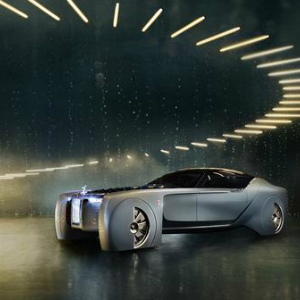 103EX is the vision of the Rolls-Royce Motor Cars design team, led by Director of Design, Giles Taylor. In the spirit of the great coach-built cars of the past, Rolls‑Royce will create the chassis of the future, hand-built from the most advanced materials and powered by a zero emissions powertrain. The ‘Voice of Eleanor’ inhabits 103EX, delivering the dream of an effortless future to her owners. Digitally connected to every aspect of her owners’ lives and her surrounding environment, ‘Eleanor’ becomes their virtual assistant and chauffeur, freeing them of all effort and encumbrance. Ever vigilant, ‘Eleanor’ safely delivers her passengers to their destination, having already predicted the situation and surroundings that await them. She is poised atop the re-imagined, yet still iconic, Pantheon grille with the red Double-R badge of an experimental Rolls-Royce. Whilst this radical new design language also contributes to an effortless, unruffled journey thanks to improved air flow and reduced air resistance, its unquestioned drama delivers a grand arrival.